Made in high-quality, durable, leak-proof materials the water hose is sturdy enough to use it for a long time. This expandable garden hose will never tangle, twist, or kink, flexible, protect the latex core from damage. Allows expanding of the flexible garden hose up to 50 ft, automatically return to its original size once empty. Choosing 9 spray patterns: full, flat, shower, cone, jet, soaker, angle, mist, and center. Standard 3/4" brass connector, works with any standard faucet in the US, with aluminum alloy On/Off Valve. Hanging hook and free storage bag helps you to save a space. Please note that the optimal temperature for using the garden hose is -5°C /50°C. Please make sure that the water pressure is in the normal range 4-12Bar (60-180PSI) to make the garden hose extend to 50 ft.
Do not expose the hose to high temperature or low temperature for a long time. Drain water from the hose when not in use, store it in the bag and out of direct sun. Because the factory is out of stock, the color of the gloves will not match the picture. 【EXPANDABLE & STRONGEST HOSE】- The garden hose march any US standard faucet, and used high-quality, free of toxins, sturdy latex, made the hose quite functional. Improved thicker and seamless material knit wall design provides a better protection for the inner tube. 【FLEXIBLE DESIGN】 - This newly designed expandable water hose will never tangle, twist, kink, flexible and easy to handle and storage! This expandable hose starts out 17ft, but when the water is turned on, the hose quickly expands up to 50 ft. The garden hose can withstand water pressure 3-12 Bar and temperature -5°C /50°C. 【FREE 9 PATTERN HOSE NOZZLE】 - The spray nozzle non-slip, solid 3/4 Inches brass connectors, rubber washer, double latex pipe, sturdy on/off valve, zinc alloy spray nozzle, its comfortable grip and rotating bezel for choosing 9 spray patterns: Full, Flat, Shower, Cone, Jet, Soaker, Angle, Mist, and Center. 【MORE SURPRISE】 - We send you free accessories include a chenille fabric car wash glove, hanging hook, 3 additional sealing rings and a storage bag. 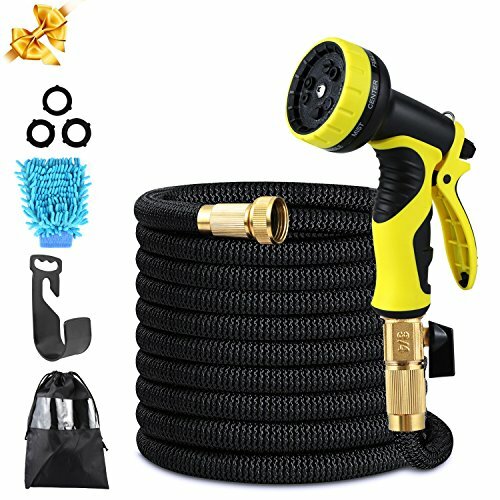 The flexible water hose is great for house/car/floor/yard washing, garden watering, pet cleaning, having fun and business use. 【WARRANTY】 - Our products have 18 months replacement warranty and 100% satisfaction guarantee, please feel free to contact us if you have any problems, we will always be there to help you. If you have any questions about this product by Pmty, contact us by completing and submitting the form below. If you are looking for a specif part number, please include it with your message.